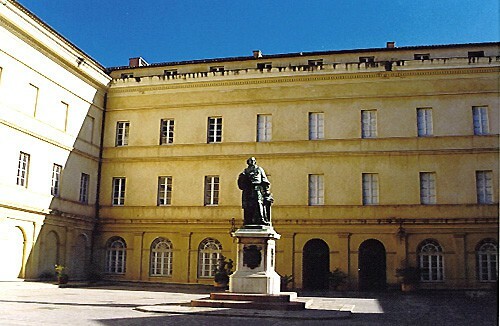 In the heart of Ajaccio lies Palais Fesch, and in that building is the Musée Fesch displaying the painting collection amassed by Cardinal Joseph Fesch (1763-1839), Napoleon's maternal uncle and archbishop of Lyons, the primate of the Gauls, a great art lover and important patron. It was Fesch's desire to found an Intsitute of Arts and Sciences in his native town, and to that end he bequeathed to Ajaccio a thousand paintings from his extraordinary collection which at his death numbered more than 17,000 works of art, of which 16,000 were paintings. Of this remarkable private collection dedicated largely to Italian painting – indeed one of the largest ever to exist – all that remains today are the paintings on show in the museum. The Cardinal himself sold some of the works, and his sole heir Joseph Bonaparte did the same, with the result that the collection no longer contains some of the Giottos, Mantegnas, Raphaels or Rembrandts that it once did. 1829, work was interupted by the Bourbon government which considered this architectural opulence displayed by an exile as provocative. Begun again in 1833, building work was completed in 1837 under the direction of the Corsican architect Frassato. The building comprises a corps-de-logis with wings enclosing a square courtyard. Fesch himself, who died in Rome in 1839, was never to see the completed work. After being used for several different purposes, Palais Fesch was significantly restored in 1987 so that, in accordance with the Cardinal's last will and testament, his collection should finally be diplayed in all its glory. The Musée Fesch has acquired an international reputation through its impressive panorama of Italian painting – it has examples from all the regions and schools in Italy from the 14th century up to the 18th century. In France, it has the largest and most important collection of Italian painting outside the Louvre. And in addition to interesting works by Flemish, Dutch, German, French and Spanish schools, there is a large Napoleonic section dedicated to the founder and his family. First on entering, the visitor is faced in the courtyard by a statue of Cardinal Fesch by the Second Empire sculptor Vital Dubray (see inset). The Napoleonic rooms, on the ground floor of the Museum, were specially created so as to take the excess material from the restricted Salon napoléonien in Ajaccio town hall. These rooms have on show works which came from bequests or donations, notably bequests from: Fesch in 1836, the Duke of Treviso in 1892, Baron Larrey in 1896, Prince Napoleon Jérôme in 1896 and Bacciochi in 1936. But the visit proper begins with Horace Vernet's Bataille de l'Alma, followed closely by portraits of the imperial family. There are in addition glass cases which present to the viewer various different sorts of Napoleonic memorabilia ranging from coarse pottery and pipes in the shape of Napoleon to occasionally remarkable individual statues and groups of statuettes (notably Bonaparte on a dromedary in Egypt, Napoleon in his coffin on St Helena, etc.). by the President of the Republic. The third room contains portraits of Princess Mathilde, King Jérôme, and the Countess de Castiglione as well as a large work by Pils, Débarquement des troupes alliées en Crimée. There is also an impressive model of the ship which brought Napoleon's body back from St Helena, the Belle Poule. The north wing of Palais Fesch, decorated by Caseneuve during the Second Empire, contains the Fesch Library with its 50,000 books – of which 8,000 were left to the library by Fesch himself. The south wing of the palace, built by Paccard and Maglioli (1857-1860), contains the Imperial Chapel, the cardinal's and other members of his family's last resting place. Please see site for full details on opening hours.